Welcome to the Nebraska State Bookstore. We're glad you stopped by and we hope that you find exactly what you're looking for. Shopping categories include books about Nebraska people, books about Nebraska History, Nebraska Cookbooks, Hiking and enjoying the Nebraska outdoors, Nebraska reference books, and calendars, magazines and newspapers, DVD and videos, and posters under MORE. In The Nebraska State Bookstore you will find information about Nebraska for readers of all ages. Age ranges for books for young readers are highlighted in red. Have fun. 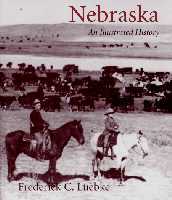 This work contains fifty-eight short topical chapters on Nebraska history that, when united with the images in this rich gallery of illustrations, present a unique history of the state. Frederick C. Luebkes lifelong commitment to the study of his state informs the book in every detail, as does his concern for clear and readable narrative. The result is a work that every Nebraskan will want to have, read, and enjoy. Familiar illustrations are accompanied by richly detailed explanations of their significance; many others, never published before, cast new light on aspects of our state history. These include the culture of Nebraskas Native Americans, the building of the transcontinental railroad, the hardship endured by European immigrants, and the contribution of African Americans to the state.